- Up to 1 Hours 85p Up to 2 Hours £1.70 Up to 3 Hours £2.55 Up to 4 Hours £3.40 Up to 5 Hours £4.25 Up to 6 Hours £5.10 All Day £6.40 Motorcycles Free Disabled Badge Holders Free Sundays are free all day. In the surgeries first year of operation the Department of Health funded UK GP Survey results for 2009-10 showed that 95% of registered patients where satisfied at the overall quality of care received, ranking the surgery at 18th out of 92. However, patient satisfaction continued to deteriorate significantly during the subsequent 12 months to March 2011 to rank the GP surgery at 66th out of 92,(see table at end of article). The GP Survey results to March 2012 will be analysed and published when available, which this review is in advance of as a summary of what patients can expect based on real experience of using the GP Surgery services as a registered patient for 6 months over a number of consultations as covered in detail in November 2011. The surgery is easy to get through to on the phone and expect appointments to be available for 1 week in advance. Expect to be kept waiting for upto 1 hour 20 minutes for a pre-booked GP Consultation appointment. Despite promises contained in the glossy leaflets and website, expect no new patient health check arranged, this is even if the patient specifically requests an appointment for a health check with reception staff in person, still the patient is likely to receive an ordinary GP Consultation on their next visit rather than a new patient health check. Quality of consultations is poor because the Surgery as personally experienced as a matter of routine dumps patients onto locum's (temporary GP's), as experienced in 2 out of 3 consultations. The flaw here is that these consultations can prove literally worthless, and have resulted in the locum GP stating that they are unable to deal with the patient symptoms and that they need to go and make another appointment with a regular GP, which the patient had already done so in the first place thus resulting in a wasted day and in having to wait another week coupled with a 66% probability of being seen by another locum despite requesting to have an appointment with a regular GP. This highlights the danger of letting the private sector contract for the NHS as without competition for patients between GP Surgeries then there is no incentive to deliver satisfactory GP or any other health services as monopolies will seek to maximise profits such as cutting costs by contracting cheaper locum GP's. Patients should aim to register with GP practices that rank in the top 1/3rd of GP surgeries as per the UK GP Patient Survey so as to increase the probability of being in receipt of satisfactory GP health services. However the flaw here is that GP practices operate as monopolies without competition that do not allow patients to register from outside of catchment areas, which means you will likely have to move house to register with a 'good' GP surgery, hence an example of the NHS post code lottery. An alternative is to pay for private GP consultations and referral which could prove costly (especially the referral and resulting treatment) which would mean that patients are effectively being FORCED TO PAY TWICE FOR HEALTHCARE. Also private medical insurance can turn out to be worthless in many cases given the multitude of small print get out clauses contained within. In terms of the big picture, One Medicare highlights the problem at the root of the NHS that the governments reforms of letting private sector firms take up GP practice delivery is the lack of a market for patients, and not for services. For if there is no real competition between GP surgeries for patients then the patient will NOT come first, no matter who is delivering the service. The core at the heart of Coalition Government's NHS reforms is to scrap ALL NHS Primary Care Trusts (PCT's) to be replaced by competing GP Consortia's to directly manage patient treatment commissioning (the process could fully take 2 years to implement, subject to revisions). 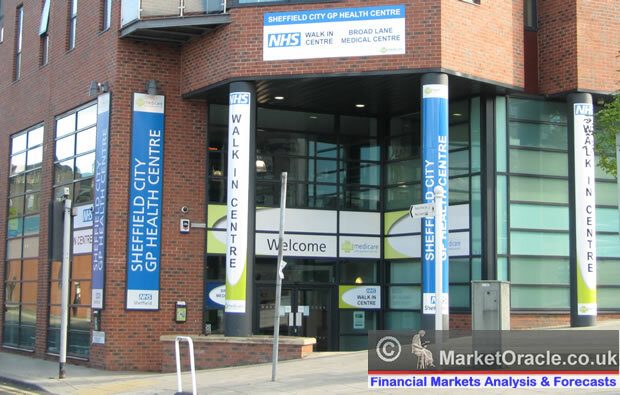 Unfortunately whilst the aim is for better value for money by means of competing consortia's, the implementation is proving to be resulting in the exact opposite anti-competitive consortia's, as virtually all of the Sheffield NHS 92 GP Practices have signed up with one of of 4 geographically located GP Consortia's in advance of the implementation of the Coalition Governments NHS reforms. The bottom line is that without real competition between GP surgeries for patients then there is nothing to drive improvement in the quality of service delivery as patients have little or no choice to register with a better performing surgery, so not only do the worst performing GP surgeries continue to operate indefinitely to the detriment of their patients health but also all surgeries are gravitating towards the lowest common denominator of increasing costs and falling productivity that results in the NHS's high internal price inflation of approx 8%, all coupled together are presenting private companies such as One Medicare with highly profitable opportunities. Therefore the government reforms are the worst of both worlds, i.e. which will ultimately allow private companies to increasingly operate not just GP surgeries but also GP consortia's eventually containing hundreds of GP surgeries in ever expanding regional blocks. 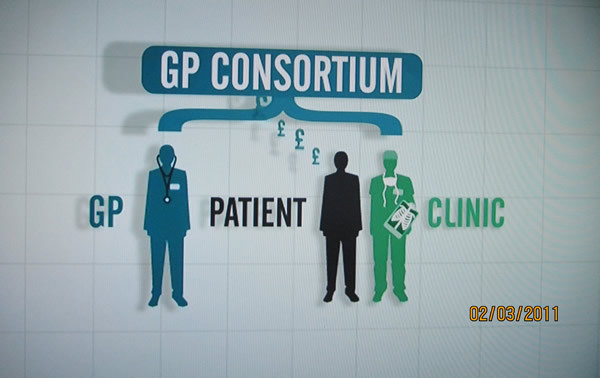 Instead the exact opposite should be taking place where patients should be allowed to register with ANY GP surgery which would result in every surgery having to compete to retain patients through improving the quality of service they offer, this off course is something that GP's would never sign up to, instead as the Channel 4 investigation reveals they are signing up to become shareholders of profit led dividends paying consortia's, where patients are seen a cash cows to milk for maximum profit. And eventually over time all of these consortia's will either go public by floating on the stock market or be taken over by large corporations resulting in huge windfall profits for the shareholding GP's.